entire lifespan of that individual." 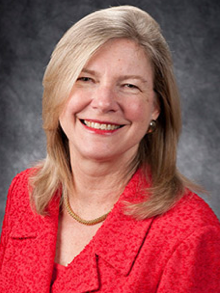 Cheryl Walker, PhD, is Welch Chair and Director, Institute of Biosciences & Technology, at Texas A&M University. Her lab explores how cancer happens on the molecular level, including gene-environment interactions that can promote development of this disease. Studies being conducted in her laboratory are identifying the mechanisms responsible for the development of cancers of the male genitourinary tract (kidney and prostate) and female reproductive tract (uterus) with the goal of utilizing this information to develop new targeted therapies. She also explores how environmental exposures to xenoestrogens such as bisphenol-A (BPA), genistein and diethylstilbestrol (DES) early in life induce developmental reprogramming of the epigenome and increase risk for developing cancer in adulthood. 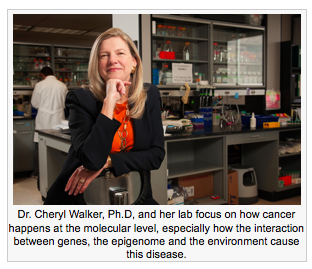 I’m delighted to talk with you about exposures and epigenetics, Dr. Walker. Can you introduce us to your work? So the words that I’ve told you are where we know things. We sometimes know what the exposures are. And in the middle, we know something about the reprogramming. We know the epigenetic landscape, the DNA methylation, histone marks, we know something about how epigenetics changes. And then, at the end of the day, we see the effect. We see the obesity, the behavioral abnormalities, the cancer. But, per the second black box, we don’t really know how the alterations in the epigenetic reprogramming is causing the effect. A lot of times we guess it is changes in gene expression, but we’re not always sure. So we are really interested in those two black boxes, between exposure and reprogramming, and between reprogramming and effect. So, for example, looking at how does a hormone interrupt the epigenetic reprogramming? Yes, how is that really happening? Some of our early work included a breakthrough, showing us a major pathway by which a hormone would be able to disrupt the epigenetic reprogramming in early fetal development. Using the analogy of computer hardware (genome) and software (epigenome), during embryonic development, when all the “software,” or epigenetic marking, is being installed, if an environmental exposure disrupts the install, the software’s not going to function right. So the changes an adverse environmental exposure might induce can affect the readers, writers or erasers of the epigenetic programming being laid down. 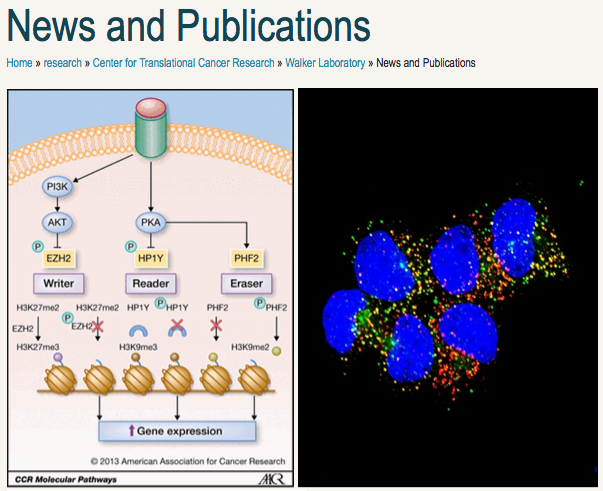 Are you familiar with the term “non-genomic signaling”? We know a lot about hormones. When these hormones act, they interact with their hormone receptor, for example for estrogen, the estrogen receptor. And then, when hormone receptors bind their hormone, they bind the DNA and act as transcription factors. That is, they can either turn a gene on or off. That’s what’s called genomic signaling for these hormone receptors. But there’s a whole other world of signaling that happens when a hormone binds to its ligand. Whether it’s DES, or a progestin, or another hormone or hormone mimic. In non-genomic signaling, when receptors see their hormones they turn on other signaling pathways, not only in the nucleus, but also in the cytoplasm. They turn on proteins, kinases, whose job is to add little chemical modifications to other proteins that either turn them on or turn them off, which then add yet further modifications to other proteins, and it becomes a spider-web-like diagram where all these proteins are talking to each other. So basically a hormone meets the hormone receptor, and in the cytoplasm it triggers proteins to start talking to each other, exchanging phosphate groups and other chemical modifications. Why is this important for epigenetics? Here’s where it gets to be important for epigenetics. When the hormones turn on these receptors in the cytoplasm, and almost all of them do, some of those cell signaling pathways actually focus on, and target, the epigenetic programming machinery. They turn the programmers on, or off, in ways that should not be happening during normal development. The hormone will bind to the receptor, which turns on the cell signaling pathways, and these proteins then start targeting the epigenetic readers, writers, and erasers, changing them so they cannot function properly any longer. So during this developmental period when all the key epigenetic programming is being laid down on the DNA, the system’s not working: the writers that are supposed to be putting epigenetic marks on are being turned off. Or, a writer that’s supposed to be silent gets turned on. 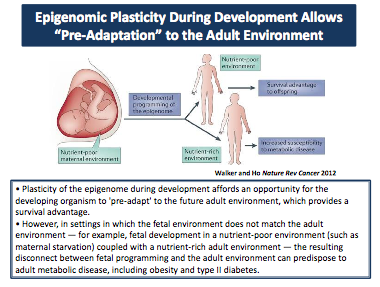 This disrupts the install of the epigenetic programming during development. In other words, the “software” providing instructions for the DNA gets buggy. When you refer to “hormones” interfering with this early epigenetic programming, are you speaking of endocrine disruptors or other substances? The receptors don’t really much care whether they’re seeing the endogenous hormone or an endocrine disruptor. What’s different about the endocrine disruptor, of course, is it gets through the protective environment that is normally in place while the fetus is developing. The mother makes abundant amounts of proteins to protect the fetus from her extraordinarily high levels of hormones during pregnancy. High levels of estrogen and progesterone are not good for the fetus, so the mother and fetus make huge levels of these steroid hormone binding proteins that act as a sink, and keep mother’s high hormones from adversely affecting the developing fetus. What’s different about the endocrine-disrupting compounds that act like hormones is this. They are not recognized by these hormone-binding proteins and they sneak right by that defense system. Could that be true with the synthetic hormones that were and sometimes are still used to treat pregnancies? Yes, that could be. Or, it could be there is such abundance of them that they exceed a threshold. I don’t know the pharmacology of that very well. But for the endocrine-disrupting compounds, a major reason why even low doses can have a profound effect during development is because they are not recognized by the steroid hormone defense system. They can sneak through and enter fetal tissues. The developing fetus must undergo all this key programming to sustain the tissue for the rest of the individual’s life, and when endocrine disruptors or other exogenous hormones come on board, they disrupt that program. The epigenetic programming is changed in a way that persists for the entire lifespan of that individual. This is extraordinary and important, I think it must have major implications for toxicology and pharmacology. This has been, to date, the major contribution from my lab— that very clear mechanistic link between how a hormone can cause a change in epigenetic programming— the box you have there in the middle of your diagram. This is one pathway we know can happen. Have you studied particular endocrine disruptors? We have some data on DES, BPA, and genistein, and we’re just getting data on the obesogen tributyltin, or TBT. We actually have a grant from the NIH, working with Bert O’Malley from Baylor, to look at this. What about germ cells? Are they different from somatic cells in some way vis a vis their susceptibility to hormone mimics? We have not tested this, but the most critical window, the greatest susceptibility, would be when those germ cells are developing, they go through the wipe and the resetting of the epigenetic programming in early embryonic development. An exposure that occurs any time during reprogramming is dangerous, whether it’s a germ cell or somatic cell. So, in sum, if an environmental exposure turns on a signaling pathway that is not supposed to be active, the kinases in that pathway can mess up the epigenetic programmers. Yes, if we disrupt the pathway, we disrupt the readers, writers, and erasers of the epigenetic program. That’s what kinases do, they are kind of like guided missiles, looking for targets. If you turn them on, via these cell signaling pathways, they’ll find their target. And when they find their target they either add a phosphate group or ubiquitin group, or other post-translational modifications that control the activity of the proteins, changing the epigenetic programming in ways that can have persistent effects across the lifespan. I feel people don't know about the history toxic, evolutionarily novel, exposures that may have affected these pathways. Science is so "siloed" into niche areas, the geneticists don't tend to think about chemical context in which genes are programmed. We do have these silos in science. That's why it's so exciting when we get together and you hear someone talking about something completely different, leading to the "aha" moments of connection, the missing links. And you never know when it's going to happen. In the traditional disease research world, so few think about these toxic environmental exposures, it's incredible.